WOOOOOO FACE REVEAL! Let me introduce Naku, our alien leader. If you ARE a patron, then you can get the special Patron role in the user list! You just have to link up your Patreon and Discord accounts. Here’s a help article to show you how! WHAT IF I TOLD YOU THAT BABY JESUS LOVES SKETCH CARDS?? For real though, I’m open for commissions! If you’re looking for a unique gift for a loved one this holiday season, hit me up. I do portraits, original characters, your favorite ship smooching, your D&D party, whatever. International shipping: It gets kind of expensive and varies by destination. Get in touch with me for a quote! My #sketchcard tag on Tumblr is the best place to see past examples! Slots are limited, since the winter holiday season gets busier and flies by faster every year. Drop me an email at alexheberling@gmail.com or send me a message on Patreon to get started. If you’re looking for something else for your gift list, check out my store! I’ve got books, prints, and pretty much everything I’ve ever sold at a convention, so there’s surely something to hit your fancy. 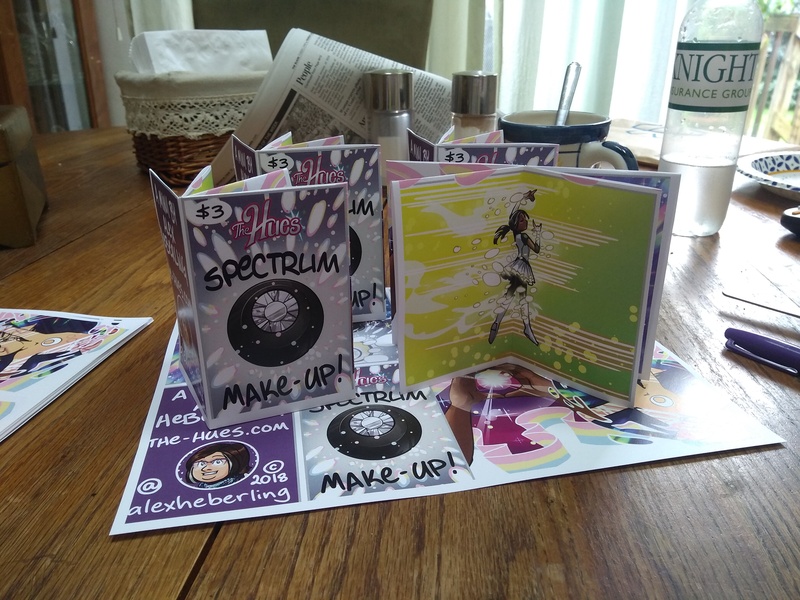 Every Storenvy order I ship will also get a free copy of my Spectrum Make-Up! mini! For digital goods, check out my Gumroad page! And for everything else, check out my Redbubble! I’ve been flirting with 1000 Twitter followers for months. I’ve been JUST SHY of 1000 followers for a few months, so if you’d like to help me creep ever closer to the elusive 4th digit, follow me on Twitter! Every time it seems like I’ve made it, Twitter purges another round of bots and I drop again. :| PLEASE HELP ME, I CAN’T LIVE LIKE THIS.